The Cable-Nelson brand traces its roots to 1903 in Chicago, when Fayette S. Cable purchased two small piano companies: Lakeside Piano Company and Sweetland Piano Company. 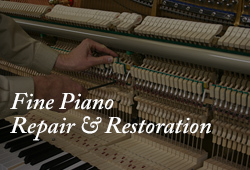 Both companies became the Fayette S. Cable Piano Company. Then in 1905, with the merger of the Fayette S. Cable Piano Company with the Nelson Piano Company, the Cable-Nelson brand was born. The Everett Piano Company bought Cable-Nelson in the late 1920s, moving its manufacturing operation to South Haven, Michigan. In 1954, the Hammond Organ company acquired both Everett Piano and Cable-Nelson. 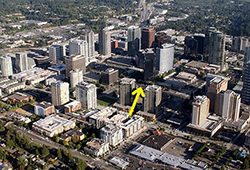 The Yamaha corporation purchased both Everett and Cable-Nelson in 1973. Now, over 150 years after its beginnings, the Cable-Nelson brand name is back on solid ground. 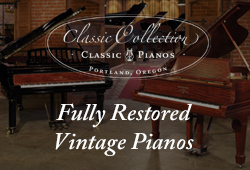 Under YAMAHA ownership and design, today’s Cable-Nelson professional uprights and baby grand pianos are, once again, positioned as veritable “Workhorse” instruments ― great pianos at modest prices. Almost anyone can afford to own a quality instrument designed and built by Yamaha. Cable-Nelson pianos are perfectly suited for home piano players who desire Yamaha quality at a more affordable price. 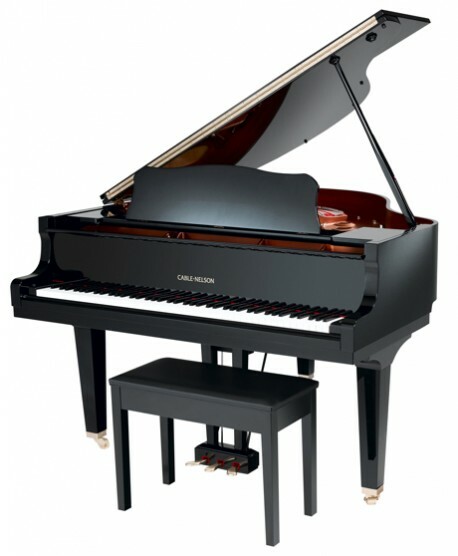 Backed by Yamaha’s 10-year warranty, Cable-Nelson pianos live up to Yamaha’s worldwide reputation for outstanding service, exceptional value, and reliable customer support. The major advantage of Cable-Nelson pianos is their excellent Yamaha quality at a surprisingly low price. The expressive instruments are designed by Yamaha master craftsmen and built by Yamaha in China. They include premium woods, acoustibars, extruded aluminum action rails and copper wound bass strings – standard features you would expect from Yamaha pianos. 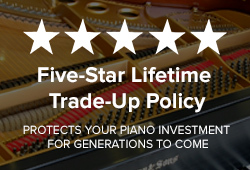 With all this quality, Yamaha confidently backs these pianos with a thorough 10-year warranty and service support, two more important advantages. Unlike many other manufacturers, Yamaha takes a total approach to piano-making by retaining complete control over virtually every component at every stage of production ― even to the point of building its own manufacturing equipment. Rather than assembling pianos from parts produced by outside companies...or contracting with third parties to build its pianos...Yamaha designs, tests, evaluates, and manufacturers all major components by itself. Another key advantage to Yamaha is the extent of the company’s expertise in related technologies. With well-established credentials in fields such as metallurgy, chemistry, and electronics...as well as more obvious areas like acoustics and woodworking...Yamaha leverages extensive internal resources to raise the standards of piano making. Yamaha’s inter-disciplinary approach results in a stable, uninterrupted, flow of innovations that leads to building superior musical instruments. For decades, Cable-Nelson was a significant brand in America. In the care and development of Yamaha, it is again.